The adoption of Application Virtualization, Virtual Desktop Infrastructure (VDI), and the availability of Windows 7 create many new and interesting possibilities for the delivery of applications and desktops. Many organizations are on the threshold of a new or updated workplace concept. Many organizations currently use traditional workstation solutions where Windows XP/Vista is installed on clients and applications are distributed and automatically installed by some sort of electronic software distribution (ESD) solution. (This ESD solution typically takes care of the installation of the operating system and any patches, asset management, and remote control functionality.) While nothing is actually wrong with the workstation solution described, the question is, "What is the next step for my organization?" Far-reaching developments in the field of Application Virtualization, Desktop Virtualization, Image Management, User workspace management, and Systems management mean that an updated (or new!) workstation concept is now within reach. This new workstation concept meets the functional requirements of the user more effectively while giving IT a better grasp of the application and desktop availability infrastructure. Q: What is the execution platform of the applications? In the case of the execution platform, system resources such as CPU, memory, disk and network are used to actually implement the Microsoft Windows and web-architected application. The most common implementation platforms are Desktop, Laptop, Smartphone, Server-hosted VDI, Client-side VDI and Terminal Services. The choice of implementation platform is the most fundamental choice. The applications are implemented locally on the device or centrally in a computing centre. An important question here is: “Where is the data?” as each implementation platform has its own characteristics. In practice, each organization actually has a mix of workstation access scenarios. The propositions “Less is more” and “Eliminate exceptions” must be kept in mind at all times! Well-known suppliers of these platforms include Microsoft, Citrix, VMware and Quest. Q: How are the applications on the execution platform made available? An execution platform is all well and good, certainly with the release of Windows 7, but if no applications are made available on this platform, it is of no use whatsoever to the end user. The second question to be asked when determining the future application and desktop delivery platform is: 'How will the (critical) applications be made available on the implementation platform?'. Various solutions exist for making Microsoft Windows applications available on the implementation platform. The most frequently-used forms are installation or virtualization. In the case of installation, applications are automatically installed (wherever possible in an unattended manner) on the workstation. Here, the implementation platform (the workstation) is modified. Installing the application in a basic image is also an option. If applications are delivered by means of virtualization, they are available ‘on-demand’ on the implementation platform. The implementation platform is not modified in this case. There are more than 8 different application virtualization suppliers. The most common are Microsoft, Citrix, VMware and Symantec. Q: How are the execution platform and the applications on this platform managed? The last question is: “How do we manage this mix of solutions?”. Traditional workstation management consists of various tasks. For example, the rollout of a (new) operating system, keeping this operating system up-to-date, insights into hardware and software usage and application installation all fall under PC lifecycle or device management. The focus of this management software is the device or endpoint. The use of user profiles, group policies and (logon/logoff) scripting, for example, traditionally constitutes the management of the ‘user workspace’. The focus in user workspace management is the end-user environment. To achieve an optimal workstation, a combination of device and user workspace management is important. Will we use PCs or server-hosted VDI? Will we use the 32-bit or 64-bit version of Windows 7? Are my applications even suitable for Windows 7? Which applications work on a 64-bit operating system? Can I virtualise my applications? How can I easily convert the existing application packages into a virtual format? The first question has everything to do with the desired functionality of the implementation platform, the first of the three questions asked previously. The following paragraphs will mainly focus on the questions: “Are the applications ready for Win7/x64/AppVirt?” and “Can the applications be easily converted from MSI to a virtual application format?”. Migrating workstations, applications and data to a new or updated platform is an art. Nonetheless, the right tools make the migration process a lot easier. For each migration, it is important to examine whether the applications are suitable for a new platform. The value of the research mainly lies in reducing the turnaround time and the risk involved in the migration. Various suppliers offer solutions for examining whether applications are suitable for a new platform. Microsoft, Acresso and Wise are three suppliers who can help you to examine whether applications are compatible. There are also suppliers such as AppDNA and Changebase who can provide extra help when it comes to checking whether applications are “Ready”. In practice, within PQR we use AppDNA. The value of AppDNA will be described below. AppDNA, the supplier of Apptitude, has developed software which examines the compatibility of existing applications with Windows 7, 64-bit Operating Systems, Application Virtualization and Desktop Virtualization, for example. The comprehensive knowledge and best practices which the AppDNA organization has gathered over the years have been incorporated into the Apptitude database. 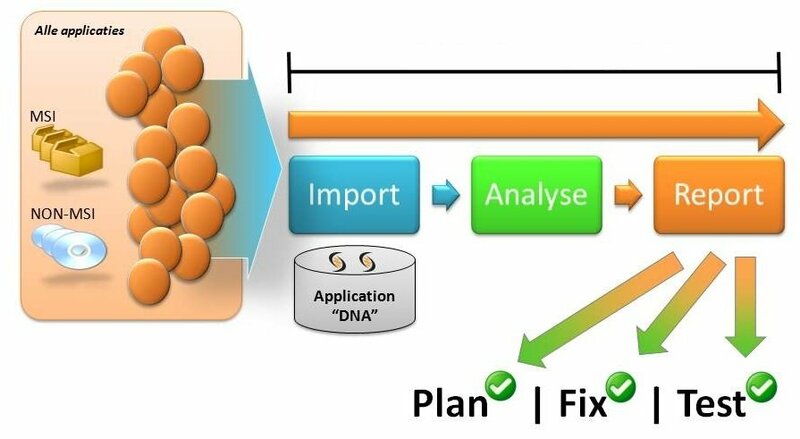 The Apptitude software uses the ‘DNA’ of the application and compares this with the information in the database. The existing applications are examined in a three-step process. The first step, the import phase, ensures that the existing MSI is imported into the system as non-MSI based application packages. The second step, the analysis phase, tests whether the applications are compatible. This research can be carried out in various different areas. The most obvious tests for this article are as follows: Application Virtualization, Desktop Virtualization, Compatibility for Desktop or Server operating system (Win7/2008R2) and x64 platform. The third and last step in the process is the report phase. First of all, a global ‘traffic light’ overview is issued. The applications which are compatible are shown in green. The applications with minor compatibility challenges are shown in orange and the applications with major challenges in red. The global management overview shows in percentage terms which applications are green, orange or red. 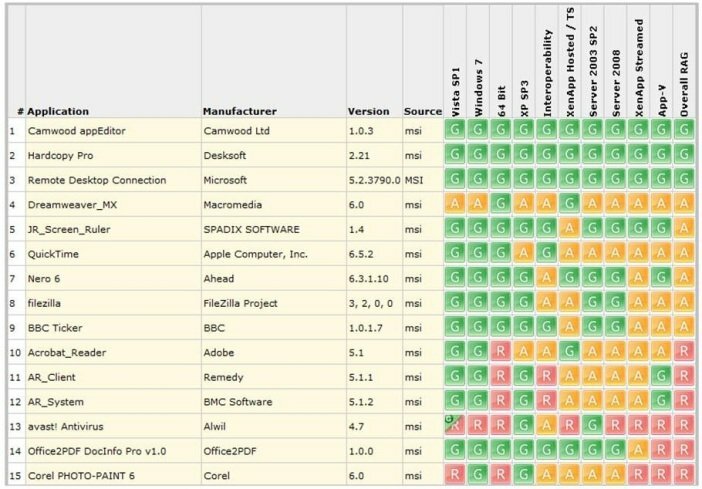 A (very) detailed report states which applications are orange or red and, more importantly, why they are not compatible. This gives an experienced packager or even the software development department the information needed to come up with a solution. Examining whether the applications are ready for the next step is important for each migration. Apptitude is a practical and valuable solution for this research. Application Virtualization ensures that the applications can be offered on the workstation quickly, dynamically, simply and without conflicts. This form of virtualization creates a separation between the application and the operating system, which means that the workstation can be used in a more manageable and cost-efficient way. Between 85% and 95% of Microsoft Windows applications can be virtualized. The success ratio depends on two factors. Firstly, which Application Virtualization supplier is used. Currently, there are more than 8 different application virtualization suppliers. Each supplier has its own vision, focus and features. The features offered by supplier A may not yet support, for example, Services, Side-by-Side (SxS) and .NET Framework. Applications which use these technologies cannot be virtualized as a matter of course. Secondly, for example, there are virtualization limitations in the support for kernel mode drivers, deep OS integration etc. If 95% of the applications can be virtualized, the (unattended) installation of applications is still required. This will also remain the case in the years ahead. The question “But how do we convert our existing applications into a virtual application format?” is frequently heard. 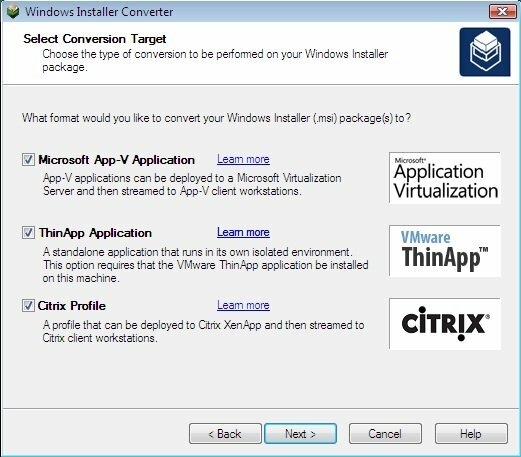 There are two ways to convert the existing application packages. The most common method at the moment is the repackaging of the application in a new virtual package format. 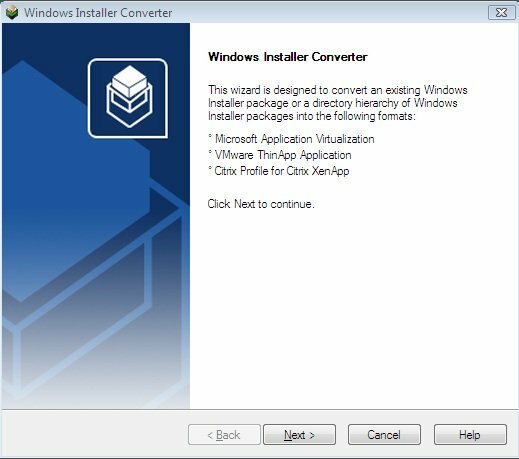 Another, very interesting, method is the fully automated conversion of existing application packages. In particular, it takes much less time to convert an application automatically than to carry out the manual actions required in order to package the application. The suppliers of traditional packaging software are very active in the field of Application Virtualization. Acresso AdminStudio and WISE Packaging Studio make it possible to convert the existing .MSI files into a Virtual application format. Depending on the supplier, conversion to Altiris/Symantec SVS, Citrix XenApp, Microsoft App-V and VMware ThinApp is possible. The success ratio of the conversion of existing application packages greatly depends on the quality of the existing packages. The technical features of the application virtualization solution also play an important role in the percentage of successful application conversions. In practice, conversion ratios of 60-70% are realistic. The combination of research into application compatibility and application conversion is very powerful. If the simple ‘green’ applications can be converted into a virtual application format in a fully automated manner, this has many advantages. The risk and turnaround time of these migration steps will then be greatly reduced. This was a remarkably prescient post. I wonder what thoughts of yours today will be the standard fare for tomorrow.